Step 1. Place 24 fingernail-shaped almond flakes into a small bowl and pour over the food colouring. Leave to soak while you make the biscuit dough. Step 2. To make the biscuit dough, using a mixer, cream the butter and eggs until combined. Beat in the icing sugar, caster sugar, vanilla and salt and mix until smooth and creamy (about 2 minutes). Step 3. Still using the mixer, add the flour and mix until just combined. Form the dough into 2 disks and cover in cling film. Refrigerate for 20 mins. Step 4.Preheat oven to 180°C or 160°C fan-forced. Line 2 baking trays with baking paper and set aside. Remove dough from refrigerator and roll 12 finger shapes from each disk. Use a sharp knife to cut knuckle ridges into the dough and pinch together for knuckles. Step 5. Place an almond fingernail on each fingertip. Bake for 12 minutes. Step 6. 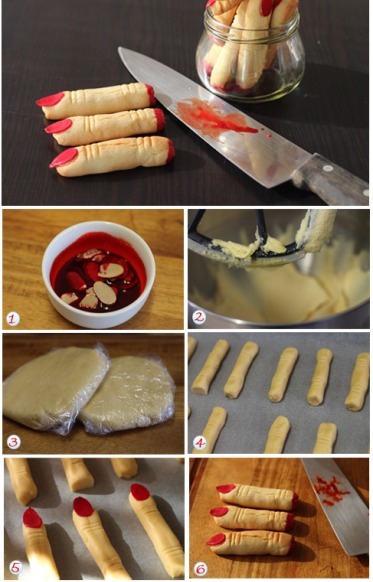 Remove from oven and dip each finger end into the food colouring. These biscuits are firm on the outside and soft on the inside. You can serve these up in a little black pot to resemble a witch’s cauldron or just put them all in a large, clear airtight jar so it looks like you have a big jar of chopped fingers. I used tweezers to get the almond flakes out of the food colouring and just applied some pressure to the centre after laying them on top. They became very firmly attached during baking. This recipe was created by Jennifer Cheung for Kidspot, New Zealand’ best recipe finder.